Our I-Spy game of things-we-don’t really-want-to-spot continues with a scorpion, the first either of us have seen in the wild (London Zoo, aged seven, doesn’t count). It was dead but in perfect condition. It’s about 7cm long, quite pale with a darker, striped body. We’re pretty good at naming different types of curry dishes – or 70s rock bands (including Scorpions) – but these things, no. 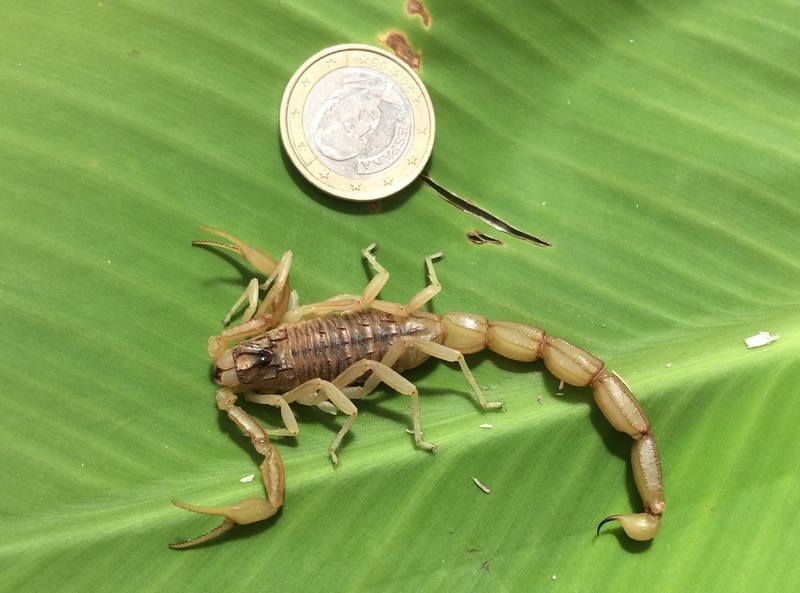 We think it’s a Common Yellow Scorpion (Buthus occitanus) although it also looks like a Buthus Ibericus. We have read elsewhere that the level of toxicity of the Buthus occitanus varies greatly across its range and that a sting from one found in Africa – which isn’t exactly a million miles away – can be fatal. Here’s our little fella(?) – what do they say? check your boots before putting them on. Click on image for higher-res. Hmmmm …. that’s the second time I heard about scorpions recently. Looks like they are moving in! I realised I was showering with one once. In Provence. That’ll do the trick! They are beautiful, aren’t they? You dropped that Euro on his head from a great height, didn’t you?! No – we would never kill anything! Anyway, it takes great skill to kill things from 10+ metres with a coin – a skill we don’t possess. Having said that, if it was in the bed it would get a good old telling off (and maybe a baseball bat). Eeeek, a scorpion in bed, perish the thought! Noooo, don’t want to see one here….